Austria | ESCKAZ.com live from Lisbon! Nathan is a very charismatic and charming performer. The intro already works as we can immediately connect with Nathan in a close up shot. The problems for me start when the camera is zooming out and reveals Nathan is sitting on a half-moon-shaped glittery object. Clouds in the backdrop. Not my cup of tea, as I find it just too cheesy. But there is certainly an audience for this. During the final notes of the song Nathan steps on a glass box. So he is 'running on air' literally. The Austrian rehearsal got quite a big applause from the press! Nathan is dressed in a white suit and starts his song sitting on a half moon, later he gets up on that moon and jumps off it. The backdrop looks really nice, with clouds that are initially pink and later turning into blue, then golden with added thunder. Towards the end it's dark blue again, as the day is over. For a big part of the song he is alone on stage, but during the last chorus or so he is joined by his backing singers. He ends the song walking onto a glass platform / cube. It's the only part of the performance I don't find really necessary. A tasty Mediterranean buffet is placed on your table. Glasses are being raised across the room. Everything happens on a magical evening in several acts filled with singing and dancing, daredevil stunts, Greek Gods, flirty waiters, and perhaps a Zorba and an Ouzo or two. The rest is up to you. Because no evening is like any other. And no one knows how it ends. It all depends on where ABBA's songs take us! But one thing's for sure: you can count on a Summer night city. The temperature at Nikos Taverna is always set on Greek high summer, regardless of season. Ready to make history? Opa!! Björn Ulvaeus invites everyone to "Mamma Mia! the Party" in Stockholm. Mamma Mia! musical is being turned into party held in the Tyrol restaurant at Gröna Lund, a few steps from ABBA The Museum. 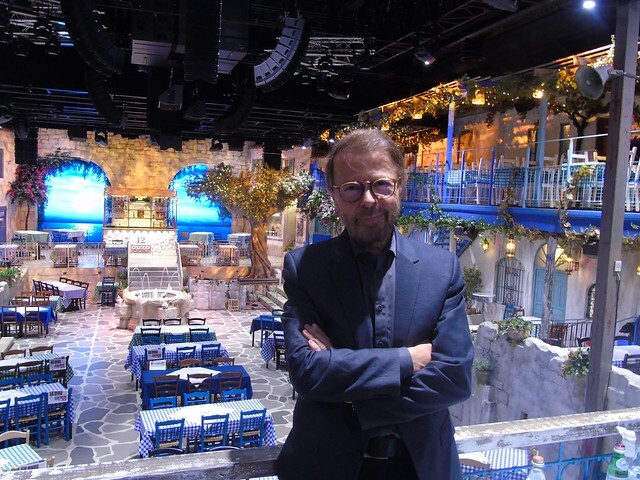 Building on ABBA tunes, one of Swedish greatest musical export successes ever, Björn Ulvaeus captured the warm, happy atmosphere of the musical and movie Mamma Mia! that have conquered millions of people around the world and turned it into a party. Planning for the production has been ongoing for 2 years with first sketchy details revealed in April 2015. ESCKAZ had the opportunity to talk to Björn Ulvaeus who is the executive producer and one of the initiators of Mamma Mia! the Party, which premiered in Tyrol on 20 January 2016. At the age of 70 Björn who calls himself "pop culture entrepreneur, investor and lyricist", is full of energy, has no plans to retire but not to get back to the active composing or stage activity either. 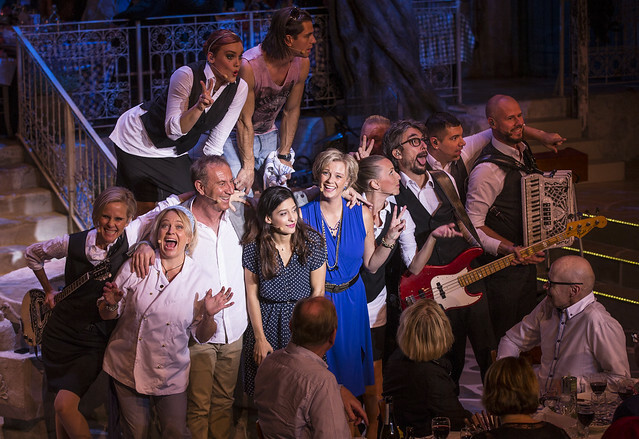 His vision of the new show is that guests, restaurant staff, musicians and artists together create the party in the Greek tavern environment from the island of Skopelos, where the Mamma Mia! the movie filmed, with olive trees, fountain and scents of the Mediterranean. With the help of the ABBA songs they write that particular evening's history there and then. With Mamma Mia! the Party are linked the two big attractions: ABBA the Museum and Gröna Lund amusement park, creating a new public magnet at Djurgården. For this purpose, legendary Tyrol restaurant has been transformed in 2015 by set designer Bengt Fröderberg into a Greek tavern. Mamma Mia! the musical has so far been seen by 55 million people around the world. The musical premiered at the Prince Edward Theatre in London on 6 April 1999. A total of 49 stagings in 16 languages were produced ​​and it is still being played in 8 productions in three different languages. The film based on the musical premiered in 2008 with actors like Meryl Streep, Pierce Brosnan, Colin Firth, Amanda Seyfried and Stellan Skarsgård. Last year Eurovision accredited press and delegates were invited to attend for free one of the best world stagings in the show Mamma Mia! in Raimund Theater with Ana Milva Gomes and Madeleine Lauw. Today, ESCKAZ team has been invited to attend the English version of Mamma Mia! the Party. The story is not same as in Mamma Mia! the Musical, it takes place after Mamma Mia! the Movie was filmed on Skopelos Island and evolves around Greek tavern owner Nikos and his new Swedish wife Kicki (who was working on The Movie production and decided to stay in Greece) who came up with the idea to organize every evening a Mamma Mia Party in their tavern while serving great food for the tourists, executive chef of the tavern Maggan, Nikos' daughter Konstantina, Kicki's son Adam and the Romeo & Juliet story between the latter two, complete with the balcony scene. There is also plenty of room for improvisation and audience participation, if the guests are up for it (and if you celebrate your birthday musicians will also play and sing a special version of Happy Birthday for you). Upon entering ‘Nikos Tavern’, the guests are greeted by Greek Gods bearing trays of Ouzo shots, before being shown to their tables and handled a local gossip newspaper "Skopelos News" with details about the cast, crew and menu. Inside Tyrol, the temperature is always set to a Greek summer evening, so dress accordingly (cloakroom in the restaurant is free of charge). An astonishingly detailed set includes the frontage of a Greek souvenir shop and a backdrop of screens showing a real Grecian sunset, which changes throughout the evening while surround effects such as the sea, crickets etc bring alive the Grecian backdrop of the popular Abba movie, Mamma Mia! Vines trail the crumbling walls, fountains dance and the air is heavy with the scent of olive trees and jasmine. As the evening progresses, the light gradually fades out as the sun goes down and candles begin to flicker. While the guests enjoy their food, the show takes place around them. There is no stage, instead the cast delivers their dialogue, sings and dances between the tables on the restaurant floor creating complete 360° experience. The music is still made of ABBA songs, but again the tracklist is different to the Musical, while some lyrics have been reworked by Björn Ulvaeus himself. The striking-looking performances are made on the lesser-known songs, "I'll let the music speak" and "I'm a marionette," which offer spectacular circus acrobat numbers with Talang show finalist Elin König Andersson, leading to the grand finale of the story itself with "Kisses of Fire". At this point, the only regret is that the story so quickly has come to the end - but the organizers predicted such reaction and is prepared a third act for all the visitors, which although isn't developing the storyline, but none-the-less is full of ABBA songs. The evening ends with Greek Zorba dancing (for which "I Had A Dream" seems the perfect fit), the tables then are moved to transform the venue into the nightclub with the dance floor and then, there is another performance that includes a medley of songs of Abba. Those guests who had not enough of 4 hours of party during the show itself can continue discoing with the DJs even after the artists have left on the recorded soundtrack of the show, other music of ABBA and dance hits. The stars of "Mamma Mia! the Party" are actors Michalis Koutsogiannakis as Nikos, Anki Albertsson as Kicky, Sussie Eriksson as Maggan, Mercedesz Csampai as Konstantina, Patrik Hont as Adam, Linda Olsson / Sofie Gunnarsson as Lotta, gymnast Elin König Andersson as Bella, four Greek ladies altering role of Grandmother: Sigrid Anastasoglou, Hrissoula Damianidou, Nikoletta Kereklidou and Maria Saivanidou and musicians Robin Svensson (Rasmus, piano & guitar), Mija Folkesson (Gittan, guitar & bouzouki), Daniel Bingert (Lasse, bass & mandoline), Pablo Cepeda (Roberto, drums & percussion) and Michael Blomqvist (Anders, guitar & bouzouki). 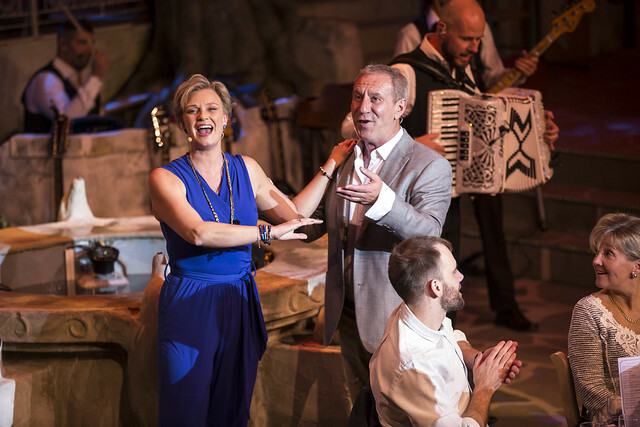 Sussie Eriksson starred as Karin in Swedish production in Mamma Mia!, Michael Blomqvist, being many times leader of huskören of Melodifestivalen, was choir member for Mamma Mia! The Movie and also performed in Swedish stage production as well as Anki Albertsson, who was Donna in Gothenburg staging and backing singer at soundtrack recording. Pablo Cepeda twice competed in Melodifestivalen. Michalis Koutsogiannakis is known for his participation in film adaptation of Millennium saga. Mamma Mia! 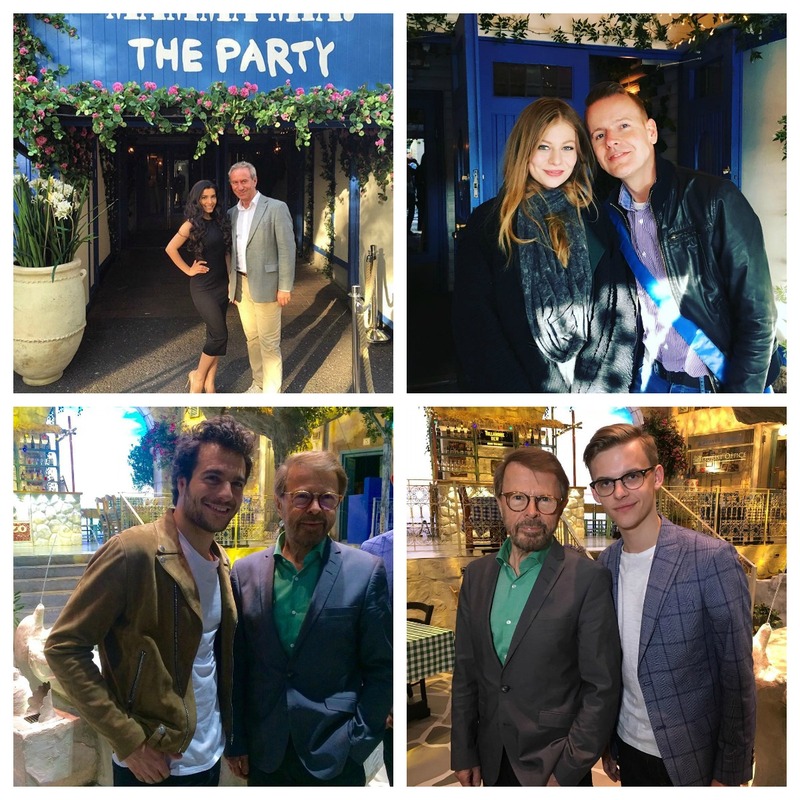 the Party produced by Eventum in cooperation with Björn Ulvaeus, scripted by Calle Norlén, Björn Ulvaeus and Roine Söderlundh, with latter being also director of the show. The whole lineup of actors and musicians is absolutely exceptional, competent and professional and are perfectly casted into the roles. Highlight of the show, however, is no doubt performance of stunning Swedish/Hungarian/Russian singer Mercedesz Csampai (watch out for her emotional rendition of The Winner Takes It All and her literally hanging-in-the-air performance of Voulez-vous in the final medley) who previously starred in various international music productions including "Tanz der Vampire" in Berlin and "The Phantom of the Opera" in Moscow. Tickets for the shows can be booked at ticnet.se. At the current moment on sale are shows till April 2017. You should absolutely buy tickets in advance, because the shows are usually sold out. Tickets cost 1340.00 SEK (around 145 Euro) per person may seem quite high at the first sight, but remember it includes dinner, and thus is in average the same as the cost of the quality concert attendance followed by a good dinner. You can also purchase combined package including admission to ABBA The Museum for 1535 SEK. Time of arrival varies on day of the week and is found on your ticket, doors remain open for appr. 45 minutes from listed time. If you plan to visit Stockholm this summer, the Party will be in English between July 27 to August 21, the other days Swedish version of the show is played (with songs still in English). The party will last for at least four hours (of them the show itself around hour and a half). Capacity of the restaurant is 450 visitors. Minimal age: 13 years, aged 13-18 are welcome accompanied by adults. Tables are reserved in the order they are booked, so there is no option to choose them. If you come in a large group you may occupy a full table for 8 or 10 people, otherwise you may be required to share a table with other ABBA fans. The plan of the hall is made to ensure best possible experience for all tables, but largest portion of action takes place around the fountain, left balcony is also used a bit more often than right one. Groups bigger than 15 persons can be booked via e-mail: ticket@mammamiatheparty.com, also can you request there (not less than a week before the show) to be seated together with your friends who booked tickets separately. A three-course mediterranean buffet is included in the ticket price, and is served at your table. The buffet is produced by Samuel Cabrera and his culinary colleagues, in consultation with Jonas Dahlbom, the new creative culinary manager at Gröna Lund. Dishes are served prior to the beginning and in the breaks between the acts. Dessert: Coffee, ouzo-flavoured semolina cream, pistachio crust, yoghurt pannacotta with honey and almond biscuits. Options are available for those with gluten or lactose intolerance, or with seafood allergies. Vegetarian or vegan menu can also be prepared if notified by mail in advance. Drinks, except from welcome one, are extra and paid at Tyrol, and, of course, there are alcohol-free alternatives. 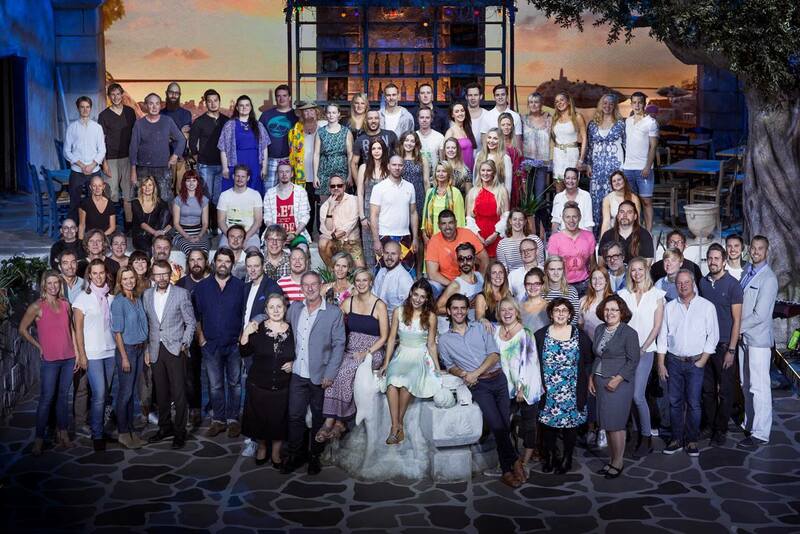 Producers of the show do not rule out international expansion of the project in the same way it has happened with Mamma Mia! the Musical (London production is at the talks already), but at this moment it is exclusively available in capital of Sweden Stockholm. The easiest way to Tyrol restaurant is by Djurgårds ferry from Slussen (last ferry back is at 23:50 everyday and at 00:30 on Saturday), or bus 67 to Liljevalchs/Gröna Lund (last bus back at 00:20), or tram 7 from Kungsträdgården to Djurgården (last one at 01:45). More on transport options: here, route planner here. Tyrol has its own entrance at Allmänna Gränd and is located on the other side of the street from the ABBA The Museum and Pop House. Amir, Samra, Juri, Zoe and Italian delegation have also visited the event during these weeks. The world premiere of Mamma Mia! 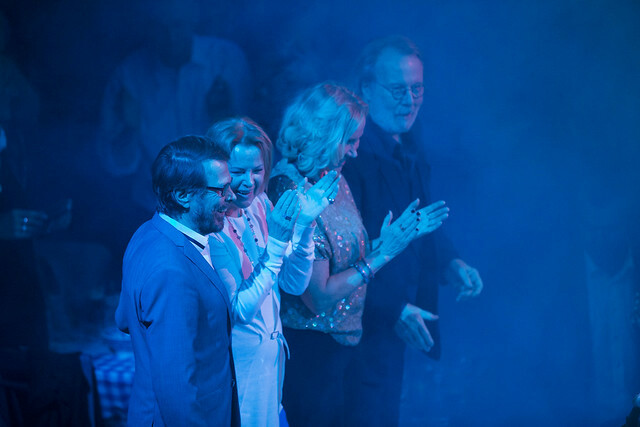 the Party earlier this year was a historic occasion as all four ABBA members, Agnetha Fältskog, Anni-Frid Lyngstad, Benny Andersson and Björn Ulvaeus, attended and posed together for the first time since Mamma Mia! the movie presentation and just second time after the supergroup split. "I don't think that (on-stage) reunion will happen, but who knows (what future brings)", surprisingly no so firmly as usual says Björn in ESCKAZ interview. For us the show definitely has been the ultimate highlight of the two weeks in Stockholm with amazing music performances and finally a chance to have a proper dinner. Finally, we would like to thank Stephanie Bonn from Zap PR for her assistance in coverage of the event. Zöe from Austria was of course asked about following the big victory of Conchita Wurst. And she talked about how happy she is to be in the contest, because just as Conchita she has also tried before to be in the Austrian national selection. And it's all about keep trying. There was also talk about how it is to work with her father, who is both the composer of her song and also her manager. Sometimes they disagree, but it's only what can be expected. Always a pleasure to be transported to a country far far away in the presence of Austria's pop princess Zoe. The Austrian team have remained close to the concept used in the national final, but they have decided to reduce the vibrant Barbie pink we saw before. This is much closer to the video concept, featuring the butterflies during the backdrop. The floor also shows a cobblestoned path, which Zoe uses on the catwalk. It feels like we're being transported to the wonderful world of Oz. The treadmill from the national performance has however been ditched. She looks stunning in her peach coloured dress, and sounds so sweet. You can tell she's absolutely loving every minute of being on that stage. Eurovision does love a fairytale/Disney connection, and it would be so lovely to see Austria benefit from this love relationship. ESCKAZ team today has visited Stift Klosterneuburg (Klosterneuburg Abbey) which was free with Vienna Pass offered to the press by ESC organizers. Klosterneuburg Monastery is a twelfth-century Augustinian monastery of the Roman Catholic Church located in the town of Klosterneuburg in Lower Austria. It was founded in 1114 by Saint Leopold III of Babenberg, the patron saint of Austria, and his second wife Agnes of Germany. The abbey church, dedicated the Nativity of Mary (Maria Geburt), was consecrated in 1136 and later remodeled in the Baroque style in the seventeenth century. The impressive monastery complex was mostly constructed between 1730 and 1834. Its foundations, including a castle tower and a Gothic chapel, date back to the twelfth century. Other older buildings still extant within the complex include the chapel of 1318 with Saint Leopold's tomb. We took a sacral tour, which lasted for about an hour and included German speaking guide and audio commentary available at different languages including Russian and English. It included a very short visit to the Collegiate Church with one of the most important organs in Europe (which was unfortunately closed and we could just see insides from the glass walls), the Leopold chapel with the grave of St. Leopold, the world-famous Verdun Altar, the seven-branched candlestick of Agnes and art treasures of the 14th and 15th centuries. Monastery also contains great shop (highly recommended, so many great religious and other things, souvenirs and memorabilia and Cafe (not recommended). It was a final and very pleasant sightseeing during our stay in Austria. We are about to start watching Jury Final Dress Rehearsal. The show starts with Conchita emerging form a box singing her new song. She’s dressed in a bright pink jumpsuit. The three hosts of the Eurovision are singing as well. Conchita is literary flying from the Green room across the Arena and she finishes her trip on the stage accompanies by children’s chore. A rap singer joins the singers. The Arena is packed with people. The hosts welcome everyone, audience is clapping. Conchita is announcing each country and they head to the stage through a corridor from the Green room. All countries from Slovenia to Italy are all together on stage. The organizers of the Eurovision produced a nice interactice video clip of how we Build Bridges. All singers are backstage already, Slovenia is getting ready to perform. The hosts are explaning the ways you can vote for your favorites. Now there is an option to vote via official Eurovision app. 1. Greeting card from SLOVENIA. Maraaya are horse riding in the country side. Nice show opener, very confident on stage. But I think it’s a bit plain on stage for people to remember their performance at the end. I would say it reaches top-12. 2. FRENCH postcard. Lisa transformed to Alice in the Wonderland. Gorgeous! Amazing voice, staging, special effects, atmosphere, everything. Every small detail has been thought over. A usual viewer needs to be prepared for such a serious song to understand it. I think some would count it as a boring one. Pay more attenction to it, please, she deserves to be in top 10. 3. ISRAEL. To my mind, it’s the only one party song this year. Without even noticing, I start dancing and singing together with Nadav although I don’t like the song. The team did a great performance, you can check his first rehearsal and you will see a great change and improvement. 4. ESTONIA is skating along a beautiful lake in their postcard. Estonian balad sounds good after a movy Israel. I like the staging a lot, the idea about the doors. The only thing, Elina has to overcome her stress and perform as confident as she did during her previous performances. 6. ARMENIA. I like the staging and the idea about families and nations from different continents but I don’t like the overall performance. It sounds to me as if I’m listening to several songs, not a one. 7. LITHUANIA’s performance is fresh and catchy, especially because of the kiss and performing after Armenia mostly. Their emotions are natural and sincere. Although many people like it, I’m afraid it won’t get in top 10. 8. SERNBIAn Bojana is showing us a very strong performance, she’s very confident and she knows what she’s doing. Unfortunately, I think her song might be lost in bright and colourfull Lithuania and white and pure Norway. 9. NORWAY is a fairytale and each girl dreams about such a fairytale. It’s beautiful performance that deserves a high ranking. To my mind it will be in top 10. Interval act. The hosts are standing in the fan zone reminding the audience about the importance of voting. 10. Sweden SWEDEN is an absolute favorite this year. It's a great TV performance, but you can see nothing what is going on the stage. It's empty and mostly occupied by camera men. Personally, I wouldn't vote for Mans but many will. So, top 5 for sure. 11. I’ve no idea what Cyprus is doing in the final. I heard today that somebody loves it a lot and I don’t understand how it is possible to choose Cyprus from that many very bright performances. Sorry Cyprus but you took somebody else place. But it's a good preperation for Australia. 12. Everything about AUSTRALI is very American and it stands out a lot. I like their performance and the voters will remember it but not that many will vote for Australia, right? Best of luck Guy! 13. BELGIUM. I cannot be objective when commenting on Loic’s performance. He’s been my favorite from the beginning and since then I haven’t changed my mind. I’m mostly impressed by the fact that he did everything for his performance himself. He probably won’t be the winner, but in top 3, I hope. 14. The Makemakes from AUSTRIA are very atmospheric if I can say so. It’s a nice song to sing with friends, it evokes many emotions of yours. The fire in the piano makes it more memorable but not enough to be in top 10, I think. Interval act. Conchita is giving advice to The Makemakes - to shave!. It's a great advice :) Conchita is revieling that last yeat it wasn't her first time participating in Eurovision. She was one of the backing vocals for a 2008 enty. 15. Impressive and beautiful performance from GREECE will probable by in top 15. There is nothing very outstanding especially being right in the middle of the show. 16. MONTENEGRO sent a true professional and a great artist. The performance hardly changed from the first rehearsal. It's motives are recognizable but still not good enough to win. So, somewhere in between 12 and 20, I imagine. 17. GERMANY reminds me lot of Lena in 2010 and Switzerland this year. I prefer Melanie Rene more that Ann Sophie. Switzerland is more mysterious, to my mind. It’s captivating and involving. You want to move straight away. So, #21, may be? 19. LATVIA. Aminata is my favorite so, I might be wrong in judging but she deserves to be in top 10. The voice, the song itself, the staging, the special effects. I want to listen to her live over and over. Goose bumps every time I hear the song. 20. ROMANIA. Well, the idea behind the song is new and interesting. I apriciate a lot that Voltaj is singign in Romanian. But it doesn't make a winner, not even my favorite. So, place 22-27? 21. I have a suspicion that SPAIN decided to use every sing possibility to use as many effects and tricks as possible. Too many things are going on the stage. But I believe she has a strong voice. Sorry, Spain, but you probably will be one of the last ones. 22. HUNGARY. Boggie has a good intention behind her song and her activity during the promo tour before the Eurovision. But it is soo boring, sorry Boggie lovers. And again we see the Universe, the whole world. How many more similar performances this year? 24. I can’t stop watching AZERBAIJAN's show. It definitely looks and sounds much better than Sweden. Please, people of the World, don’t kill me for such a comparison, but I really feel like that! 25. RUSSIA would be perfect for the show closing, it would leave special feelings. Now, it's surrounded by 4!!! very strong songs and I think it's very difficult to make it through. Polina now won't be neither #1 nor #2. I guess she's in top 10. 26. Despite many controversies about ALBANIA I must admit that she improved a lot since the semi-final. It is now an absolutely different performance – the dress change and the performance concept even may be. It now sounds less aggressive. I won;t be surprised if she happens to be in top 15 at least. 27. ITALIAN Il Volo is an absolute winner of this year even though I don't like it as much as some other singers. Very confident and strong performance. Being the last ones to perform makes them winners. And they definitely deserve it. Before the fake voting we are entertained by orchestra playing different types of music for us.